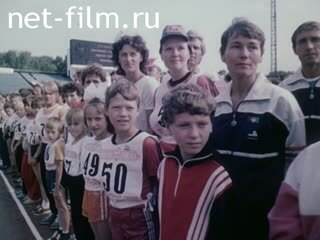 About the I All-Union Labour Trade Union Sports and Athletics Competition in the city of Moscow in summer of 1989. The film is about holding in Moscow 1-Union labor Olympics: a parade of athletes at the stadium "Locomotive", the laying of wreaths at the Mausoleum, the tomb of the Unknown Soldier, the competition swimmers, weightlifters, cyclists. Competing athletes with disabilities. Traditional International Peace Marathon for the prize of the newspaper "Moskovskaya Pravda". Award winners. A panorama of a poster in the street with the inscription: ”The 1st All-Union Labour Trade Union Sports and Athletics Competition - a Festival of Sports and Friendship of the USSR Peoples”. The building of the stadium “Locomotive”. A panorama of the opening of the Labor Sports and Athletics Competition: sportsmen are walking along the stadium. The Vice-Chairman of the Supreme Council of the All-Union Voluntary Athletic and Sports Society, chief referee of the Labor Sports and Athletics Competition, sixfold champion Lydiya Pavlovna Skoblikova-Polozkova is welcoming the sportsmen. A panorama of sports families on the stadium. A panorama of sportsmen applauding. A panorama of a Moldavian landscape - vineyards, etc. Apricots are being poured out in the box. The Wrestling Competition "Trynta" (a national kind of sports). Girls wearing in national costumes are watching. A panorama of the audience applauding. The winner is being awarded with a sheep. The festival ”Vadulluy-Vode” (Moldova): the final of the Republican Sports and Athletics Competition - sportsmen are standing on the stadium. The audience on the stadium. A panorama of runners starting, running, finishing. The family Andronakys from the town of Faleshti: the driver Jury, his wife Tatyana and daughter Natasha are at the start, then running, tenting, surmounting the obstacles, finishing. A panorama of the Volga River quay in the city of Kuibyshev, the berth with the inscription "Kuibyshev". The poster of the 1st Regional Labor Sports and Athletics Competition. A panorama of a sports family –a mother and a son. The finish of the men's race. A panorama of the spectators under umbrellas. A panorama of a volleyball game in the street. A panorama of the brigade consisting of Bychkov, Bragin, Zobnin, Nechaev, Kolesnikov and Samoilov walking along workshop # 56. Participants of the All-Russia Star Relay Race are running with flags. The Vladimir region: Muscovites are offering the participants in the relay race bread and salt (traditional Russian welcoming). A panorama of participants in the All-Union Labor Sports and Athletics Competition standing at the Lenin Mausoleum, laying a wreath, passing by (many of them are dressed in national costumes). A panorama of the Grave of the Unknown Soldier. A panorama of participants in the Sports and Athletics Competition placing a wreath and flowers. A panorama of the volleyball game. The Swimming Competitions on the Water Stadium in the Luzhniki District- the start, they are swimming. A panorama of weight lifter competitions at the Exhibition of Economic Achievements. A panorama of Table Tennis Competitions indoors. A panorama of family teams playing. Family teams are on the stadium. The Andronakys are at the start. A panorama of the relay race: children are running, passing the baton to their mums. A panorama of mums passing the baton to their daddies. A panorama of the head of the Andronakys family finishing; his wife and daughter are hugging him. A panorama of girls in suits of different trades doing recreative gymnastics in the street. The bicyclists are at the start. Foreign sportsmen, Sport Committee representatives are on the stadium. A panorama of the parents with children at the start. A panorama of the children-bicyclists starting. A panorama of the men-bicyclists (riding road bicycles) riding along the street. The audience in the street is watching. A panorama of bicyclists finishing, the audience is applauding. A panorama of disabled women in wheelchairs. A panorama of the winner of All-Union and International Competitions Irena Perminene finishing. A panorama of L.P.Skoblikova-Polozkova talking to I.Perminene. A panorama of the participants in the competitions among invalids being awarded with gifts; the audience is applauding. The traditional Moscow International Peace Marathon for the Prize of the newspaper ”Moskovskaya Pravda“ [“The Moscow Truth“] (in the Sportsman’s Day): a panorama of the runners at the start, covering the distance (running along the centre of Moscow). A panorama of the foreign sportsmen running. The Kenyan sportsman Endru Tumo is running. A panorama of the 22-years-old student from the city of Minsk Sergey Kozlov (marathon winner) participating in the race and finishing. A panorama of the awarding. The ball of the Labor Sports and Athletics Competition participants in the Palace of Sport “Izmailovo”, dancing.